In India, caste groups ensure their durability in an era of multiculturalism by officially representing caste as cultural difference or ethnicity rather than as unequal descent-based relations. Challenging dominant social theories of caste, this book addresses questions of how caste survives the system that gave rise to it and adapts to new demands of capitalism and democracy. 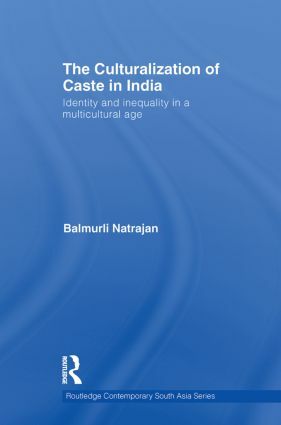 Based on original fieldwork, the book shows how the terrain of culture captured by a new grammar of caste revitalizes castes as cultural communities so that the culture of a caste is produced, organized and naturalized in the process of transforming jati (fetishized blood and kinship) into samaj (fetishized culture). Castes are shown to not be homogenous cultural wholes but sites of hegemony where class, gender and hierarchy over-determine the meanings and materiality of caste. Arguing that there exists a new casteism in India akin to a new racism in the USA, built less on biology and descent and more on purported cultural differences and their rights to exist, the book presents an extended critique and a search for an alternative view of caste and anti-casteist politics. It is of interest to students and scholars of South Asian culture and society. Balmurli Natrajan is Assistant Professor of Anthropology at William Paterson University of New Jersey, USA. His research interests include group formation, caste and race, cultural theory, globalization and Hinduism.